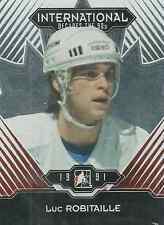 This auction is for a 2012-13 In The Game, ULTIMATE MEMORABILIA BASE CARD EMERALD of Luc Robitaille. The card is #'d 52/60...!!! All cards that I have listed are in "NM-MINT" condition unless otherwise noted in the write-up. ONTARIO 13%. NEW BRUINSWICK 15%. NEWFOUNDLAND 15%. NOVA SCOTIA 15%. P.E.I. 14%. OUR OPINION : SEE SCAN CONDITION. SASKATCHEWAN 5%. 2010/11 ITG 100 YEARS OF CARD COLLECTING INSERT CARD. 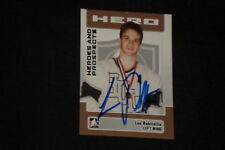 Luc Robitaille 2012 ITG Superlative Plus Numbers Silver 9/9. Condition is Like New. Shipped with USPS First Class Package. ONTARIO 13%. NEW BRUINSWICK 13%. NEWFOUNDLAND 13%. NOVA SCOTIA 15%. P.E.I. 14%. NO CREASE CLEAN BACK. ONTARIO 13%. NEW BRUINSWICK 15%. NEWFOUNDLAND 15%. NON GRADED CARDS. NOVA SCOTIA 15%. FRONT: SEE SCAN. P.E.I. 14%. CENTERING : SEE SCAN. Card is serial numbered 17/25 made! All cards are NM or better. A great looking card from a very expensive product! Cards are from the regular 300-card issue and the 200-card Update Series Set. The 18 cards in this team set include Item(s) must be in their original scanned condition. Mikko Eloranta. Cliff Ronning. 2017 LUC ROBITAILLE LEAF IN THE GAME USED HOCKEY GLOVES OFF GLOVE #ED 1/5!! Luc Robitaille ITG Ultimate Vault 1/1 on UM - 03 Emblem Sapphire Logo. Shipped with USPS First Class See photos for condition, feel free to ask any questions. Thanks! 2013 TORONTO FALL EXPO REDEMPTION ! THESE CARDS WERE ONLY AVAILABLE AT THE 2013 TORONTO FALL EXPO ! 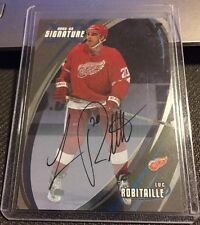 2010 ITG Decades 80s LUC ROBITAILLE AUTOGRAPH. S hipping Fees Are at a Flat / Set Rate for C anada & U.S.A. RECORDED 1,394 CAREER POINTS . SCORED 668 CAREER GOALS . GUJ-33. Luc Robitaille. 2 color. 1 of /9. GOLD Version. 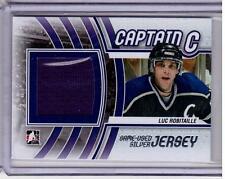 YOU ARE LOOKING AT A2010-11 ITG DECADES 80s LUC ROBITAILLE ROOKIE JERSEY SILVER CARD. STATED PRINT RUN OF 40 . To CANADA.